What’s the quickest way to turn less into more? According to two local boutique owners, the secret lies in collaboration. While they could be considered competitors, Jackie Wells-Lindstrom of Too Belles Boutique and her friend Brody Kenneweg of Traveling Chic Boutique envision a future where area retailers join hands to bring customers the best of all worlds. That future starts December 10 with a holiday pop-up event you won’t want to miss. 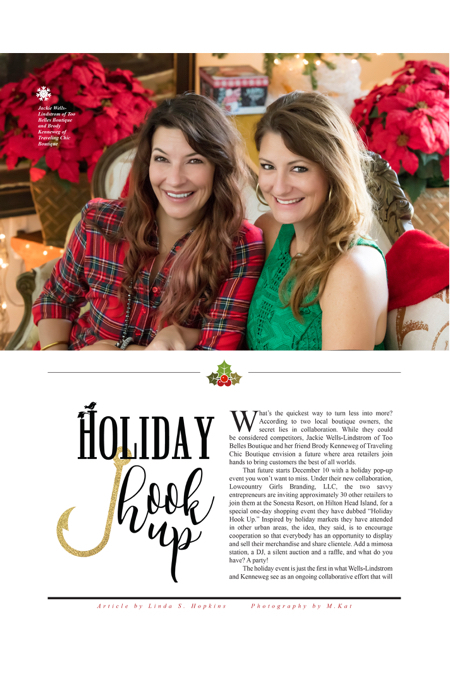 Under their new collaboration, Lowcountry Girls Branding, LLC, the two savvy entrepreneurs are inviting approximately 30 other retailers to join them at the Sonesta Resort, on Hilton Head Island, for a special one-day shopping event they have dubbed “Holiday Hook Up.” Inspired by holiday markets they have attended in other urban areas, the idea, they said, is to encourage cooperation so that everybody has an opportunity to display and sell their merchandise and share clientele. Add a mimosa station, a DJ, a silent auction and a raffle, and what do you have? A party! The holiday event is just the first in what Wells-Lindstrom and Kenneweg see as an ongoing collaborative effort that will not only be a shot in the arm for local retail establishments, but a huge boon to consumers. “That’s really what Lowcountry Branding is all about and the holiday hookup. It’s about creating relationships. It’s about broadening the horizons and being able to service so many more people and to give all these female entrepreneurs that same opportunity,” Kenneweg said. If you are a store owner or service provider, this is your chance to tap into an area-wide clientele. Traffic is expected to be brisk, and it’s a brilliant way to let shoppers know about your store or service. By participating, you will gain exposure to a customer base through group advertising prior to the event, have the chance to sell to these customers at the event, then receive the client database post-event. Plus, you will be part of the on-trend pop-up shop and mobile shopping experience, making sales and having fun! If you are a consumer, this is your lucky break—an opportunity to do all your holiday shopping in one fell swoop, without having to run all over town. Holiday Hook Up will include a wide array of merchandise for your convenience and shopping pleasure. Participating vendors include clothing boutiques, pet stores, gift shops, spas, gyms, artists, food purveyors, and more. Merchandise as well as gift cards will be available. But the win/win doesn’t end there. Did somebody say silent auction? Yes! You will have an opportunity to bid on items contributed to the auction via all the retailers represented and, at the same time, give back to women in need right here in our community. “This first event is going to be female-driven, benefiting Hopeful Horizons [formerly Hope Haven and New Horizons],” Wells-Lindstrom explained. Each retailer who participates in the hook up will donate an item to be auctioned, and all the proceeds from that portion of the event will be distributed to the organization, which provides safety, hope and healing to survivors of child abuse, domestic violence and sexual assault. The first hour of Holiday Hook Up (11 a.m.-noon) is the CH2 VIP Hour. For a $15 entry fee, you will be privy to the mimosa station, food and beverage samples, swag bags, and more, while getting a jump on the crowd for a more relaxing shopping experience and best selections. Admission to Holiday Hook Up is free from noon-6 p.m. For more information, including the vendor sign-up link and advance VIP tickets, head over to lowcountrygirls.com, e-mail lcgbranding@gmail.com, or call (843) 295-9003.
Who, What & Why: Holiday Hook Up features female entrepreneurs at their best! Lowcountry Girls Branding is providing the ultimate shopping experience for locals and guests, complete with mimosa station and a live DJ playing the sounds of the season. Shop, enjoy and give will be the theme of the day. Holiday Hook Up is a great way to help other women in business as well as those in need through local charity, Hopeful Horizons. When & Where: December 10, from 11 a.m.-6 p.m. at the beautiful Sonesta Resort on Hilton Head Island.